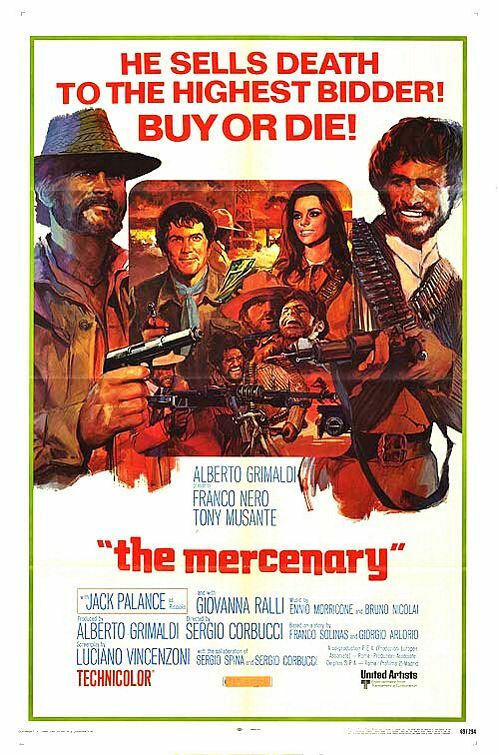 Set during the Mexican Revolution, Sergio Corbucci's THE MERCENARY tells the story of three men whose lives intersect during this turbulent time. Paco Roman (Tony Musante) is a lowly mine worker who finally gets fed up with the lousy food (beans, with the occasional unfortunate lizard that has fallen into the pot for meat) he and his compatriots are served while on the job. So he holds his bosses the Garcias at gunpoint and gives them a taste of how the other half lives. But, as the narrator tells us, “taking from the rich to give to the poor is never popular with the rich”. Paco winds up buried up to his neck in the sand, but his friends help him make a last minute escape before he gets trampled by men on horseback. Shortly thereafter, Polish mercenary Sergei Kowalski (Fraco Nero) arrives in town and is hired by the Garcia's to transport their silver across the border into the United States. Little do they realize that all around shady character Curly (Jack Pallance) notices their meeting and rightly assumes something big is going on. Once he ascertains from the Garcia's exactly what that is, he sets out after Kowalski to get the silver for himself. Paco, now leading a group of workers turned bandits/dubious revolutionaries, also returns to the mines hoping to get his hands on the money. The three main characters owe an obvious debt to Sergio Leone's 1966 film THE GOOD, THE BAD, AND THE UGLY, although none of the characters in THE MERCENARY are exact analogues to the ones in Leone's film. In particular, Musante's Paco is a far more honorable character than Eli Wallach's Tuco (“The Ugly”), who he most closely resembles. All three main characters are initially motivated by varying degrees of self interest, but Paco eventually comes to believe in the ideals of revolution, which in Kowalski's point of view is, “the shortest way to the cemetery.” In Paco's case, at least, that's at least partly due to the fact that his newfound revolutionary zeal feeds his arrogance. Sergio Corbucci has a grittier style than Leone, and his scenes of violence tend to be more visceral and graphic. He's not trying for that same epic feel of Leone's films, but something more down to earth. There are numerous twists and turns and changes of fortune, and we're never really sure who, if anyone, we should root for. At least until the end, when we see that at least some of the characters have learned something from their adventures. 3 1/2 out of 4 stars. Couple things I meant to mention in this review. First, Palance's character is named "Curly", same as his character in 'City Slickers'. Not sure if it was an intentional homage or just a coincidence, but kind of interesting. Second, I reviewed the film in its English language dub. The version showing at the Cinematheque is the Italian language version with English subtitles. I asked John Ewing, director of the Cinematheque, about why he is showing the Italian language version (Italian exploitation movies were all shot without sound and dubbed in post, so there is no "true" audio track). He explained that the Italian language version is the only one available for theatrical exhibition. Regardless, it's a film worth seeing in any language.